If it doesn't, please contact me and let me know. A little bit ago, while in London at Real World Crypto and hanging out with some browser and SSL folks, I mentioned the thought "Why isn't there a directive in HSTS to require OCSP Stapling?" (Or really just hard fail on revocation, but pragmatically they're the same thing.) They responded, "I don't know, I don't think anyone's proposed it." I had batted the idea around a little bit, and ended up posting about it, but it didn't get much traction. I still think it's a good idea I'll probably revisit sometime soon... but while thinking more about it and in other conversations a more immediate thought came up. What about requiring Certificate Transparency? The motivation behind requiring Certificate Transparency for your site is to ensure that any certificate used to authenticate your site is publicly logged. Excepting, of course, locally installed roots which everyone is upset with because of SuperFish. But that's independent of the topic at hand. 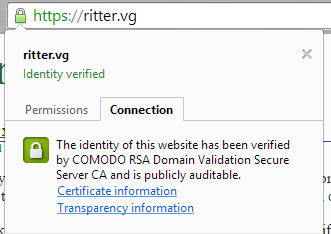 As a site operator, you can be certain that no one has compromised or coerced a CA, maybe even the CA you chose to pin to, into issuing a certificate for your site behind your back. Instead, you can see that certificate in a Certificate Transparency log! I mentioned pinning. Pinning is a very strong security mechanism, but also a very risky one. You can lock your users out of your site by incorrectly pinning to the wrong Intermediate CA or losing a backup key. Requiring CT is also risky. But, the risk of footgunning yourself is much lower, and similar to requiring OCSP Stapling, is mostly around getting yourself into a situation where your infrastructure can't cash the check your mouth just wrote. But CT has three ways to get a SCT to the user: a TLS Extension, a Certificate Extension, and an OCSP Extension. So (in theory) there are more ways to support your decision. In reality, not so much. Certificate Authorities are gearing up to support CT, and if you work closely with one, you may even be able to purchase a cert with embedded SCTs. (DigiCert says all you have to do is contact them, same with Comodo.) So depending on your choice of CA, you may be able to leverage this mechanism. Fortunately, the third mechanism is entirely in your control as the server operator. You can deliver the SCTs in a TLS extension if the client requests them. Sounds great right? Heh. Let's go on an adventure. Or, if you want to skip the adventure and just see the screenshots, you can do that too. Now, to be clear, CT is in its infancy. So things will get easier. In fact right now CT is only deployed to enable Extended Validation indicators in Chrome - and for nothing else. So don't take this blog post as a critique of the system. Rather take it as jumping ahead a couple years and proofing out tomorrow's protection mechanisms, today. 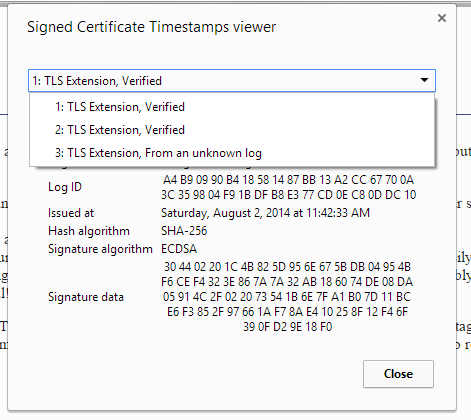 First off, before you can actually deliver SCTs to your clients, you have to get an SCT - so you have to log your cert. There are several functional, operating logs. Submitting a certificate is not done through a web form, but rather an API, as specified in the RFC. To help with this, I created a tiny python script. You will need to open your site in your browser first, and download your certificate and the entire certificate chain up to a known root. Store them as Base64-encoded .cer or .pem files. They should be ASCII and start with "-----BEGIN CERTIFICATE-----". Now call submit-cert.py with the certificate chain, in order, starting with the leaf. You can specify a specific log to submit to, or you can just try them all. No harm in that! Something else you might notice if you examine things carefully is that your certificate is probably already in the Google logs. (Check ctwatch.net for your cert now.) They pre-seeded their logs with, as far as I can tell, every certificate they've seen on the Internet. Wait, what? Yea, before we can configure Apache to send the TLS extension, we need to make sure our TLS library supports the extension, and in OpenSSL's case, that means 1.0.2. Fortunately, gentoo makes this easy. In general, this entire process is not going to be that difficult if you're already running Apache 2.4 on gentoo - but if you're not... it's probably going to be pretty annoying. Okay, now that we're using OpenSSL 1.0.2, we need to configure our webserver to send the TLS extension. This is really where the bleeding edge starts to happen. I'm not aware of any way to do this for nginx or really for anything but Apache. And for Apache, the code isn't even in a stable release, it's in trunk. (And it's not that well tested.) But it does exist, thanks to the efforts of Jeff Trawick. The two patches you will need for Apache 2.4 I have here and here. These patches (and this process) are based off Jeff's work but be aware his repo's code is out of date in comparison with httpd's trunk, and his patch didn't work for me out of the box. Jeff updated his patch, and it works out-of-the-box (for me). You can find it here. As of Apache 2.4.20, you no longer need to patch Apache! Thanks Jeff! For more information check out his github repo. Now if you read the module documentation you discover this module does a lot. It uses the command line tools from the certificate-transparency project to automatically submit your certificates, it handles proxies, it does auditing... It's complicated. Instead, we want the simplest thing that works - so we're going to ignore all that functionality and just configure it statically using SCTs we give it ourselves. The CTSCTStorage directive is required, it's a working directory where it's going to store some temporary files. The CTStaticSCTs directive tells it look in this directory for files ending in .sct for SCTs for that certificate. So we need to put our SCTs in that directory - but in what format? It's not really documented, but it's the exact SCT structure that's going to go into the extension. You'd think that structure would be documented in the RFC - in fact you'd probably expect it to be right here, where they say SerializedSCT... but no dice, that's not defined. Instead you can find it here but it's not really apparent. I figured it out mostly by reading Chromium's source code. It's a known issue that you don't get the link or SCT viewer on Mac, but it will say "and is publicly auditable". That's all well and good and took way more work than you expected, but this only sends CT information, it doesn't require it. For that we need to go, edit, and compile another giant project: Chromium. Wait seriously? You're going to go patch Chromium? Hell yea. Like I said in the beginning: requiring CT, today, is a proof of concept of something from the future. 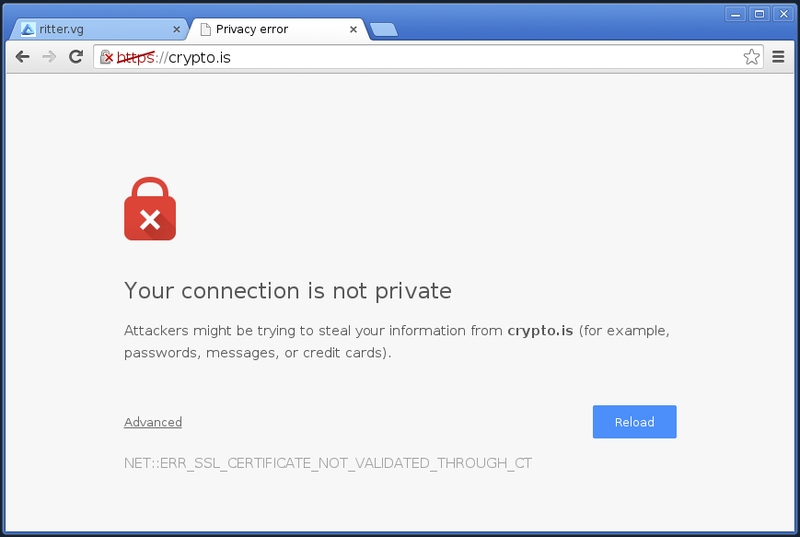 We may get to the day where Chrome requires CT for all certificates - both EV and DV. But not yet, and not for several years at least. Today, we need to patch it. But rather than patching it to require CT for every domain on the internet - that would break, AFAIK, every single domain except my two and Digicert's test site - instead we're making it a directive in HSTS that a site operator can specify. Building Chromium is not trivial. Unless you're on gentoo in which case it's literally how you install the browser. I worked off Chromium 42.0.2292.0 which is already out of date since I started this project 10 days ago. But whatever. I used the manual ebuild commands to pause between the unpack and compile stages to test my edits - unless you use that exact version, you'll almost certainly not get a clean apply of my patch. And that, I think, is kinda cool. [stolen from reddit! ](http://reddit.com) stolen from reddit!